Arctic Cat’s quality starts with a rugged HSLA robotically welded frame and super-tough body panels. No other OEM offers these features. High-strength tubular steel front and rear racks. 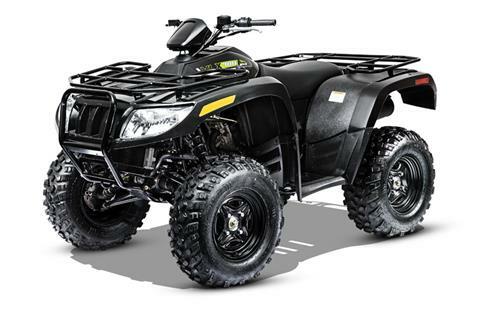 Duramatic™ automatic transmission, and Arctic Cat-built H1 engine for superior power. Closed-loop electronic fuel injection means better fuel range and can contribute to longer engine life, and only Arctic Cat® has it. Rear 2 in. receiver with 1,050 lb. of towing capacity. DIGITAL INDICATOR GAUGE: This no-nonsense indicator light gauge provides the basic information that keeps you in the know. Park, neutral, reverse, temp and engine warning notification lights let you know exactly what the situation is. CARLISLE TRAIL PRO TIRES WITH STEEL WHEELS: Purpose-designed construction makes for a smoother ride and better shock absorption. The non-directional tread pattern provides excellent cornering. The Carlisle® Trail Pro® is lightweight and versatile. FRONT & REAR STEEL RACKS: Rated for 100 lb. carrying capacity on the front and 200 lb. on the back, these high-quality steel racks are made to hold up to the task.